Wallach is director of Public Citizen’s Global Trade Watch. The group recently posted the pieces “Study: ‘Trade’ Deal Would Mean a Pay Cut for 90 Percent of U.S. Workers” and “A Fast Track to Greater Inequality?” which states: “While Obama denounces inequality, the Obama administration is rushing to conclude talks on the Trans-Pacific Partnership (TPP), a sweeping commercial pact with 11 Pacific Rim countries that implicates everything from the cost of our medicines to the safety of our food. 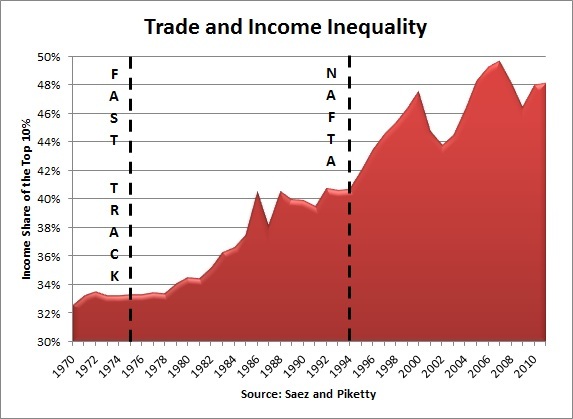 The TPP also threatens to further widen the gap between rich and poor, as emphasized by economist Nancy Folbre in a New York Times piece … by perpetuating the inequality-spurring history of unfair trade deals spelled out below.” There’s a congressional teleconference on TPP this morning. Protests and other actions by fast food workers are expected in 100 cities in the U.S. today.